It was a familiar series of events for the No. 1 team in the state. Wilsonville was tested early, giving up points to quality opposition and encountering the best the other team had to offer. Then, shortly thereafter, the team found its rhythm, scoring frequently from all phases of the game until it was far from competitive. Wilsonville dominated the visiting 16th seed Ridgeview High School 54-20 Nov. 2 and secured itself a spot in the quarterfinals. 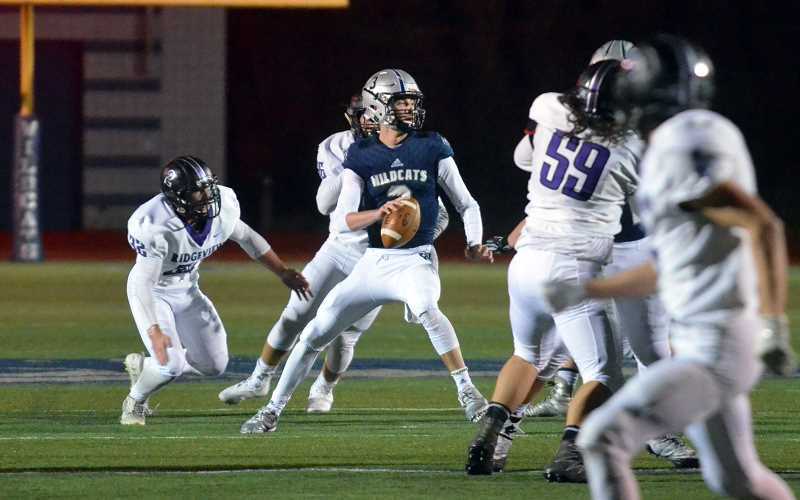 It was yet another game where Wilsonville quarterback Nathan Overholt shined, scoring several touchdowns through the air and scrambling for another. The scoring actually began with an Overholt pass to senior wide receiver Jonah Gomez from 8 yards out, Gomez's first of two on the night. Despite having four touchdowns on the night, it was not Overholt's strongest game of the season. The veteran quarterback went 11-of-17 on passing attempts for just 195 yards. Head coach Adam Guenther credits the Ridgeview defense for limiting one of his offense's stars. "The first half just seemed a little off," Guenther said. "I tip my hat, those guys had a great game plan, they did what they normally do and it just took us a while to get going. Once we did, we were good to go. Cooper (Mootz) had a great day today, and they obviously came out trying to stop Nathan. They did a pretty good job of it in the first half. Cooper decided to run then." And run Cooper did. In one particular drive midway through the second quarter, Mootz ran the ball five straight times. On the final play of that particular drive, Mootz ran up the middle for a 20-yard touchdown at 7:32 of the quarter. "It felt great," Mootz said. "That's like the youth football days where I got the ball every play and our offensive line was lights out today. All the credit goes to them, and our execution in practice. So many things went into that to get a really great drive like that where I'm the workhorse. It was nice." Wilsonville went into the locker room at half time with a 27-7 lead. The second half saw the Wildcats explode offensively, as the first play was Overholt connecting with senior wide receiver Jonah Gomez for a 45-yard touchdown pass up the left-hand side of the field just 16 seconds into the half. On the ensuing Ridgeview possession, Wilsonville's Christian Ramirez recovered a fumble on the Ravens 24-yard line. Also coming up big for the Wildcats was senior wide receiver Zach Rivers, senior Cade Edmondson, and sophomore quarterback Jayce Knapp, all of whom had touchdowns on the night. On the next play, Overholt hit senior wide receiver Sam Westing for a touchdown at 10:48 of the third quarter. The pattern of quick strikes continued throughout the duration of the game, and Wilsonville walked away with the win 54-7. "We're playing good ball right now, but in the playoffs anything is possible," Guenther said. "You have to stay healthy and have a little luck, and that's the key to a playoff run. Right now we're fairly healthy, and the ones that are bumped and bruised have to get back to ready to go." The Wildcats (10-0) will face off against the eighth ranked Crater Comets (8-3) Friday, Nov. 9. The two teams met previously in the season opener on August 31, with Wilsonville winning 53-20. Mootz expects a similar result to the first game, provided the team continues firing on all cylinders. "I'm confident in our team, but it's the playoffs, so we can't overlook any team," Mootz said. "I want us to go all gas the whole game. But if we keep executing, I expect the scores to be the same and us to be on top."